This was originally out on King Street’s ‘Miami 12’ compilation and now it gets set for a full release with remixes from Japanese producer DJ Keiichiro, Marcelo Vak & Alex Roque and our preferred mix from Eric Kupper. The Vak & Roque mix is a chunkier one, geared to work well at peak-times on the dance floor and NYC- based Keiichiro’s mix takes the track into the deeper side of techno. 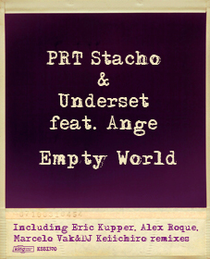 The Eric Kupper mix gives the track a stronger, deeper bassline, keeping it very minimal with floaty swishes and keys as Ange’s haunting vocals are on repeat at the beginning and end of the mix, but perform the full song midway through the track. This track and in particularly, this mix, is very deep and pure house music and should do well at many underground clubs around the world. It should do will in Ibiza this season too, in the right places. Check out the original mix below, it’s over nine minutes long.